Clay and I recently bought a grill. We had been waiting a long time to purchase one since we wanted our backyard remodel to be complete before buying one. Since we haven’t even started the remodel, we decided it was a pretty lame reason to forgo the summer grilling season. We bought a combined gas and charcoal grill because I couldn’t decide which one I wanted and I just knew I had to have a charcoal grill. My love for charcoal grilling developed in part due to the time I’ve spent in Vietnam. Almost everything is grilled over these small charcoal grills. The smokey flavor of charcoal goes so perfectly with the intense sweet-savory flavors of meats marinated in ingredients like fish sauce, sugar and soy. 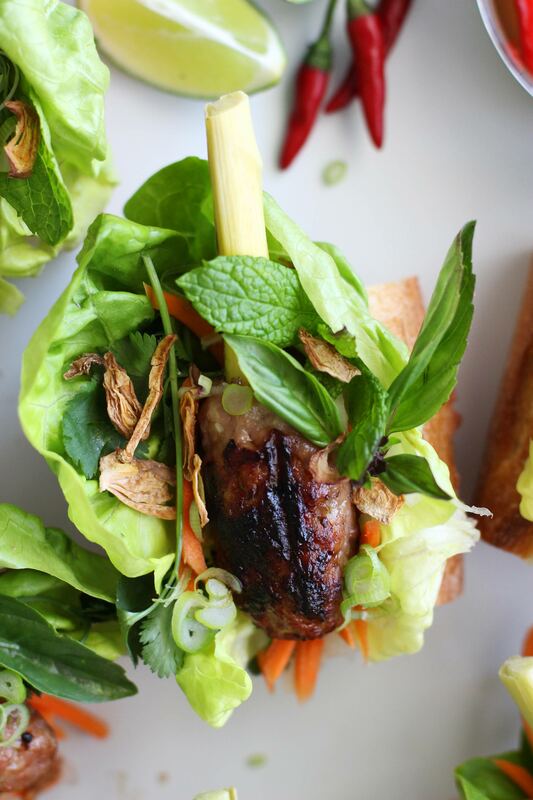 And my favorite part of Vietnamese food is that it’s all paired with fresh and bright herbs like mint and cilantro. It’s honestly one of the few things I could eat for weeks on end and not be tired of. 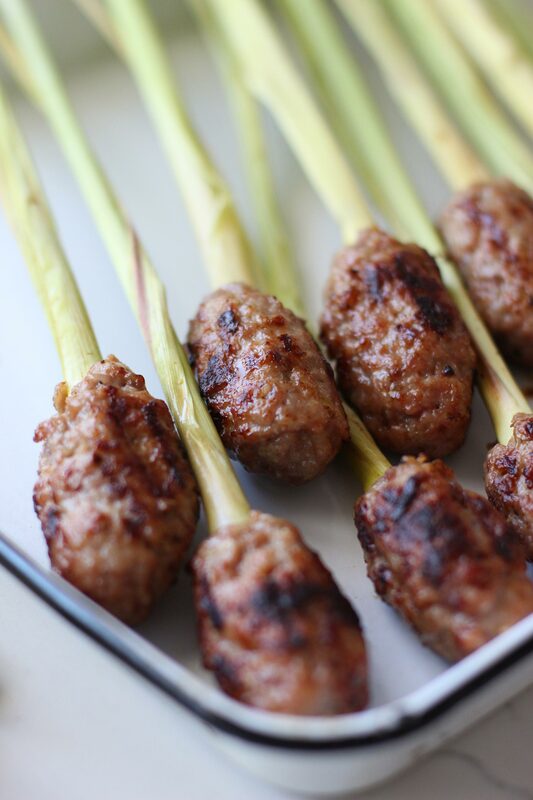 This dish (nem lui hue) uses stalks of lemongrass to impart a mild lemongrass aroma to the meat. Its fibrous stalks double perfectly as skewers. I’ve made little sandwiches with the skewers here, but they would be perfect on their own. Also, you can easily turn these into lettuce cups by omitting the bread. After the skewers are cooked simply dip them into a little nuoc cham, the ubiquitous Vietnamese sauce made of fish sauce and lime juice, and eat it anyway you like. I can’t wait to make loads of these this summer! To make the skewers, combine all skewer ingredients (except the lemongrass stalks), in a bowl and using your hands or a fork mix to combine. Cover with plastic wrap and allow to sit in the refrigerator for at least 1 hour to overnight to allow the flavors to develop. Peel outer layer of the lemongrass stalks. Rinse in water and dry. Take one handful of the pork mixture and wrap around the end of the lemongrass stalk, gently pressing and moulding the meat around the stalk. Repeat with the remaining meat and place on baking sheet. Grill over coals or gas grill for about 6-10 minutes until cooked through. Make sure to rub the grill with a paper towel soaked in vegetable oil to ensure your skewers don’t stick to the grate. To make the nuoc cham, combine all ingredients together. 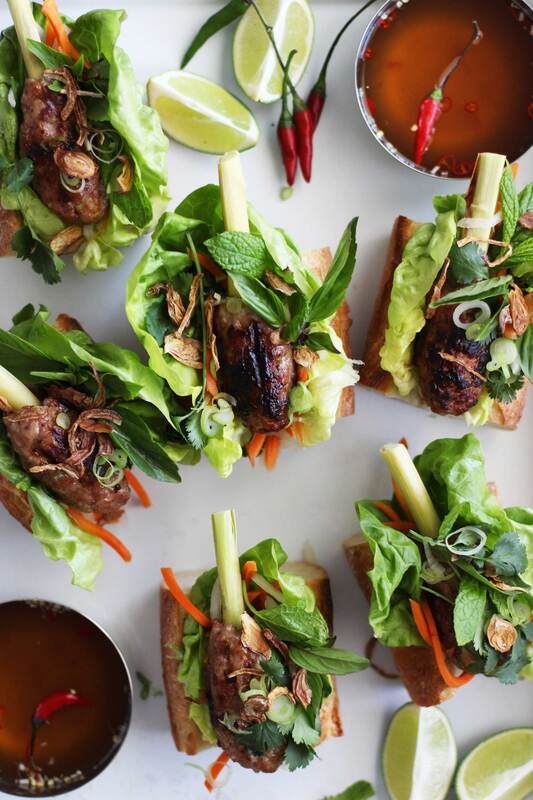 To assemble the sandwiches, trim the lemongrass skewers with scissors. 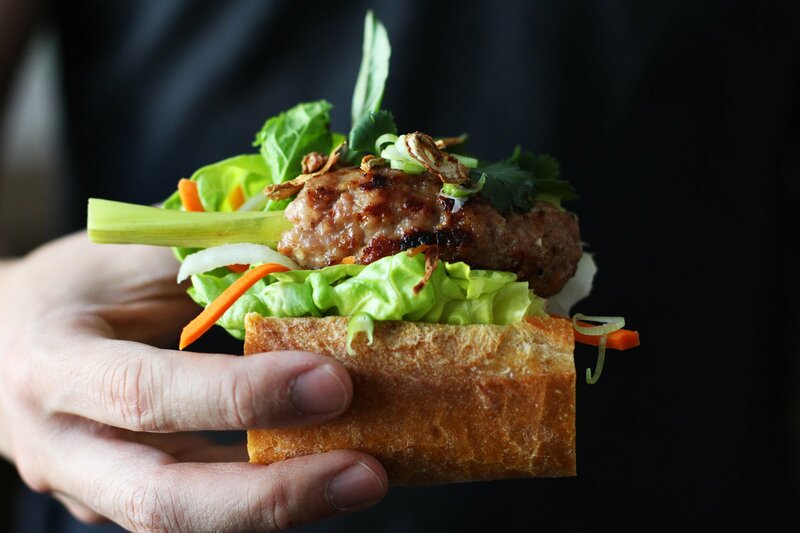 Place a leaf of the Bibb lettuce on the bread, add some pickled carrots and daikon, top with the lemongrass skewer and top with cilantro, basil, mint and shallots. 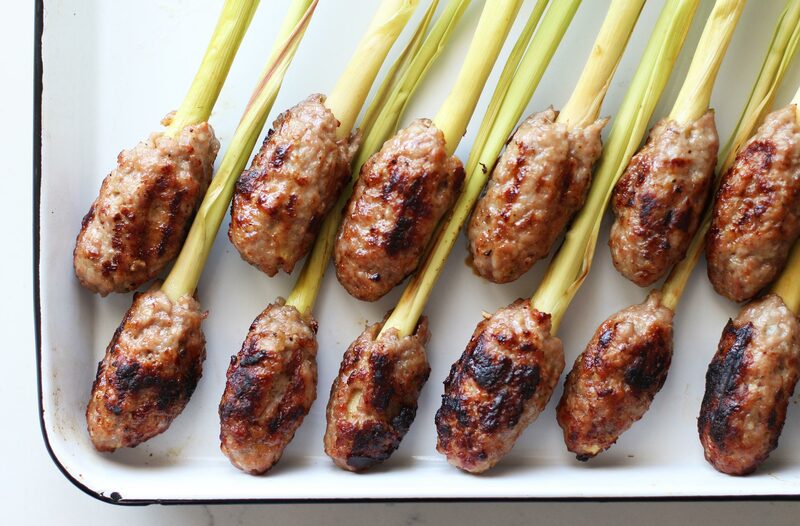 To eat, dip the lemongrass skewer into the nuoc cham and using the bread pinch the meatball with one hand and twist and remove the lemongrass stalk with the other. You can also make lettuce cups by omitting the bread. can’t wait to bbq more! THESE LOOK EPIC! Loved seeing the snaps of the progress. If I waited to buy things before I checked things off of my remodel list, I’d never buy anything. Ha! Why does everything take so much longer to get done than you think?? 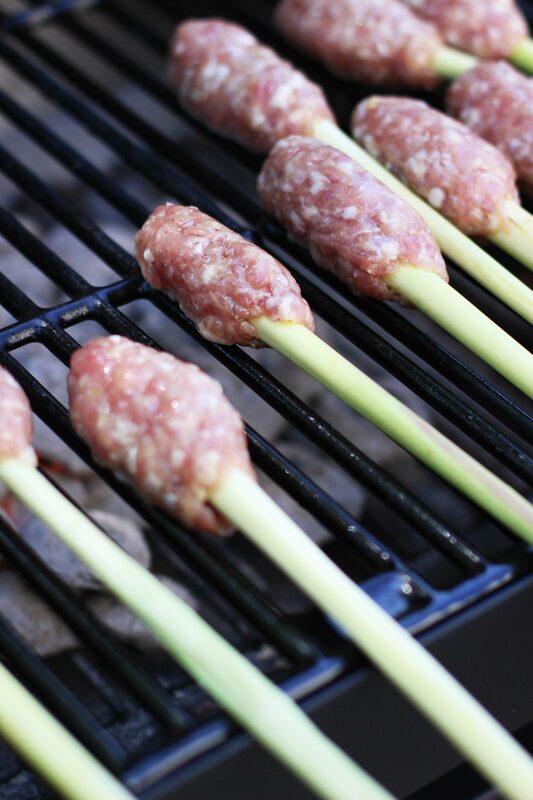 These skewers look like the perfect bite, I have to try using lemograss as the skewer, what a great what to infuse maximum flavor! I like the sound of this! I’ve never seen anyone use those lemongrass stalks but it sounds like a very good idea. Love the combination of mint and basil in the sandwich as well!